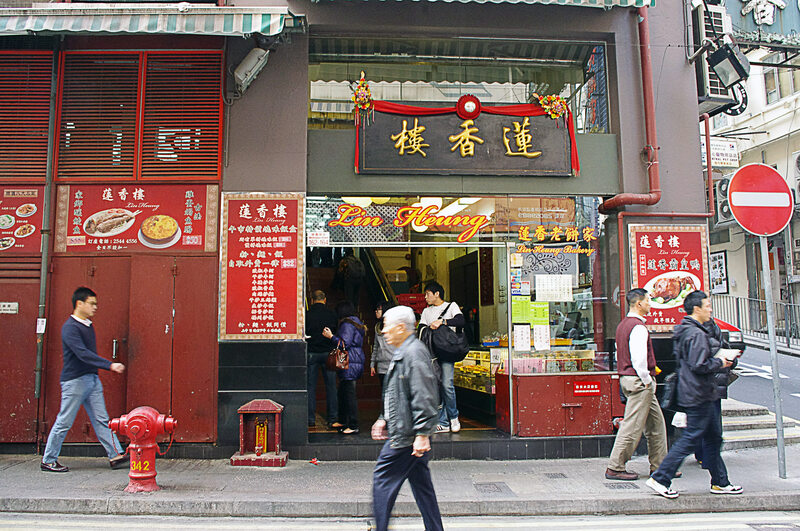 There's nothing like a bit of history and tradition to get you excited about a meal, and Lin Heung Tea House is steeped in it. Lin Heung is one of Hong Kong's last remaining traditional tea houses that serves dim sum in the old school style—on carts that are wheeled around the restaurant. Dim sum and tea drinking go hand-in-hand, so before you indulge in your small snack, you'll need to order your tea. When you order your tea the server will fill the bowl in front of you with tea—this is NOT to drink, but to rinse your cup with. We know what you're thinking, 'ummm… isn't my cup already clean?' Don't worry the cups are clean (or at least they should be) this tradition still hangs around from yesteryear. To partake in said tradition simply dip your cup in the bowl, slosh the hot tea around a little and dump it back in the bowl. The server will then fill up your cup with tea. Remember you're suppose to pour tea for others before yourself, if the person you are pouring for is on the right side you would hold the pot with the left hand and vice versa. If you need more hot water for your tea pot simply tilt the lid of your tea pot and a server will fill it up on their next round. You don't order from a menu at Lin Heung, and there isn't a waiter that takes your order (well apart from the tea above), instead when you see a cart roll by you stop the server, open the bamboo steamer lid, and decide if you want what's inside. You'll have a small order sheet, which the server will check off indicating which dishes you've taken back to your table. This all sounds very quaint right? It is in theory, but when the restaurant gets busy—and it can get very busy—quaint can turn to crazy pretty quick. To get the good dishes you gotta be fast, and truthfully a bit pushy. Imagine that you live in a family with 20 siblings and there's only enough dinner for 12 of you, if you want to eat, you better get ready to throw an elbow or two. Okay, don't actually assault anyone, but don't sit quietly at your table either otherwise you might only get tea. If this sounds like insanity to you, and not the way you want to spend meal time, avoid the busy breakfast and lunch rush. Keep in mind dim sum is only served during breakfast and lunch, if you go for dinner it's more like a regular restaurant with full main courses. Lin Heung was originally known as a blue-collar type of place, so nothing about it (including the food) is fancy. The food here is cheap though, each dish has 2-3 good sized dim sum pieces, and most dishes will run you between HK$16-25 ($2-3 USD), with a few of the larger dishes reaching HK$30-45. There are better places in Hong Kong to get gourmet dim sum, but if you want to see the old school trolleys in action there's no better place in the city than Lin Heung.